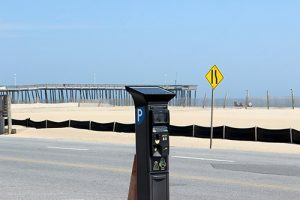 OCEAN CITY — The holiday weekend will bring a first look at the sweeping changes in the resort’s parking system as the paid parking season gets underway on Sunday. Earlier this year, the Mayor and Council approved a new state-of-the-art parking payment and enforcement system for the streets and municipal lots in the downtown area to the tune of nearly $600,000. The new system utilizes state-of-the-art license plate reader technology and will result in a switch from the current “pay and display” system to a “pay by plate” system. The new solar-powered paid parking kiosks have been sprouting up along streets in the downtown area and at the various municipal lots throughout the resort in recent weeks, and the new system is ready to go operational on Sunday, April 1. At the Inlet lot, the new pay-by-plate system is in place, but enforcement will be manual for the first couple of weeks. Visitors and residents will still park wherever they find open spaces on the streets and municipal lots in the downtown area and visit a nearby kiosk to make payment arrangements for their desired time periods. However, instead of printing a receipt to be displayed on the dashboard of their vehicle, they will enter their license plate information. Enforcement officials will then be able to scan the vehicle’s license plate to see about payment. The fine for an expired parking meter on the streets or in the municipal lots other than the Inlet lot was $15 if it is paid within 48 hours and $25 if paid after 48 hours. The $15 early fine and the $25 fine after 48 hours has been eliminated in favor of a flat $50 fine. However, a customer can arrive back at his or her vehicle, discover the meter has expired and a ticket has been issued. The customer can than pay for overage at a kiosk or by phone, thereby voiding the parking ticket. Initially, the grace period for simply paying for the parking overage and voiding the ticket was set at four hours. However, the council voted to reduce the grace period to just one hour. The thinking is someone who went to the beach or out to dinner and overran his or her parking meter payment by an hour could benefit from the grace period and the good will that comes from avoiding a parking ticket. Perhaps the biggest changes with the new system will come at the Inlet parking lot, where the traditional gated system is being replaced with a combination of license plate readers (LPRs) at the entrance and exit to the lot and the new kiosks where residents and visitors can pay for parking. The council this winter raised the hourly fee at the Inlet lot to a flat $3 from April 1 to Oct. 31. Currently, rate is $2 per hour in the shoulder seasons and $3 per hour in the peak seasons from Memorial Day to Labor Day. With the new LPR system, the hourly rate at the Inlet lot will be $3 across the board. Another change is how customers will pay for parking at the Inlet lot. With the fully-automated LPR system, if customers don’t pay to park using the kiosks or the app on their mobile phones, the LPRs will read their tags when they enter and when they exit. Those customers will then be sent through the mail a bill for the number of hours in the lot times the new rate of $3 per hour plus a $25 administrative fee. If the customer does not pay the bill within a prescribed amount of time, it then becomes a parking ticket.